Rylee Nichols braces to trap the ball in an away game. “The game was unlucky,” said head coach Chris Chapdelaine. 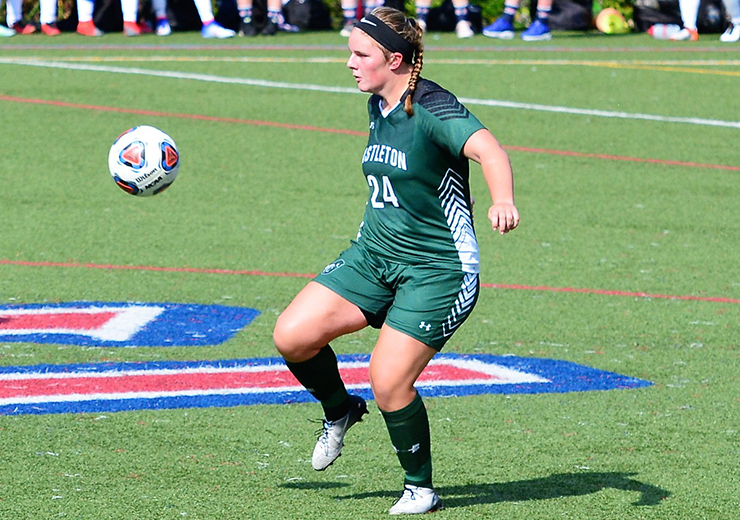 The Castleton women’s soccer didn’t have the home opener players hoped for, falling to Emmanuel College 4-1 on Saturday. The loss pushes the Spartans to 1-3-0 on the season, while the Saints improved to 3-1-0. The lone goal for the Spartans came in the 88th minute of the game by Jamie Barrett. She collected a through ball from Erin Tully that left her with just Lexi Gawron, Emmanuel’s goalie, to beat. Gawron was slow to react and Barrett sent the ball sailing into the goal. The rest of the game didn’t go quite as nicely. It began in the 11th minute, when the Saint’s Kaylin Deschenes launched a free kick into the top corner, just out of Castleton goalie Lauren Henderson’s reach. Later that half, Emmanuel’s Sydney Allen launched a corner kick into the box and teammate Emily Medeiros completed the play with a strong header to go up 2-0. The second half didn’t get much better for the Spartans, aside from the sole score by Barrett late in the half. Emmanuel opened the half with a penalty kick off an unintentional hand ball in the 47th minute of game time. Emmanuel would then score their last goal of the game three minutes later on a breakaway by Natalie Dash. The score doesn’t tell the entire story of the game, though. The Spartans and Emmanuel were very close statistically. Both teams had 14 shots, and both Henderson and Gawron had five saves. Castleton had 6 shots on goal and Emmanuel tallied 9. It was a defensive battle and the Saints were able to execute on their opportunities. Castleton will be looking to bounce back from their loss and establish a rhythm this afternoon against MCLA. The Trailblazers will enter the match 1-2-0 after a grueling 1-0 loss to the Sage Gators on Friday. Look for the Spartans to come out stronger at 4 p.m. today. “Conference play starts next Saturday for us, so we have to get better,” Chapdelaine said.